Sober Look: Two factors are moderating healthcare costs, but are they benefiting the consumer? Two factors are moderating healthcare costs, but are they benefiting the consumer? The growth in healthcare costs in the US has slowed substantially in recent years. NY Times: - Since 2004 — nearly four years before the economic downturn — the rate of health care inflation per person has been just 0.8 percent higher than the growth of the G.D.P. Between 1965 and 1993, for comparison, it was 3.2 percent higher. JPMorgan: - Medicaid is jointly funded by federal and state governments, though the administration of the program is carried out at the state level, including decisions about the level of care and eligibility for the program. Cash-strapped state governments have taken a variety of measures to cut back on Medicaid spending, particularly after a temporary bump up in the federal share of funding expired in mid-2011. In fiscal year 2012 states undertook 193 separate actions aimed at containing Medicaid costs, such as freezing or reducing provider payments or increasing copayments. This fiscal year the states intend to take another 150 steps to limit Medicaid expenses. NY Times: - ... over the last 43 years, costs per beneficiary grew 2.7 percent faster than the overall economy. That’s why Medicare spending rose from $7.7 billion in 1970 (or 0.7 percent of gross domestic product) to $551 billion in 2012 (almost 4 percent of G.D.P.). But this trend has finally reversed; over the last three years, Medicare costs per person have grown 1.3 percent slower than growth in the overall economy. In January, a Department of Health and Human Services report showed that Medicare spending per beneficiary grew just 0.4 percent in 2012. And last week, the Congressional Budget Office lowered its 10-year Medicare spending projection by $137 billion. 2. In spite of improved trends in healthcare costs, health insurance premiums are still rising sharply. NY Times: - Major insurers are proposing painful, double-digit premium increases in 2013. In California, Anthem Blue Cross, Blue Shield of California and Aetna all announced rate increases of 20 percent or higher for some of their customers. ... insurance companies are uncertain about the future, particularly about what will happen to their margins when the new exchanges open in October. The natural response to uncertainty is caution, and for insurance companies, the cautious approach is to increase revenue and profits as much as possible in the short term in case Obamacare lowers them in the long term. These rising premiums have helped insurance companies' margins but have forced more strapped consumers to move into high-deductible plans, which are considerably cheaper. Of course more people these days don't have any insurance at all or carry only hospitalization coverage. Having to pay for medical services out of pocket, except for the really large expenditures, is forcing consumers to spend less on care in general. Many simply don't seek care until they absolutely have to, which is reducing the overall demand for medical services (other than hospitalization - hospital admission rates seem to be at pre-recession levels). This weaker demand, driven by higher out-of-pocket requirements, helps contain general healthcare costs. 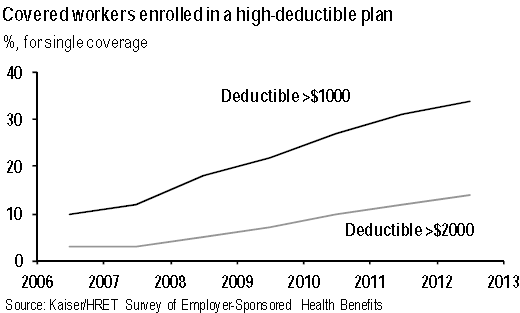 Consumers either pay higher premiums or higher deductibles, covering a larger portion of their care out of pocket. Similarly, medicaid recipients pay higher co-payments or face limited access to care. Clearly some of this is absolutely necessary in order to stabilize the out-of-control healthcare spending in the US (see discussion). But to argue that these trends are somehow helping consumers is simply flawed.